The Roman Catholic Church in Chile has urged the government to pardon any members of the country's military who show repentance for the crimes they committed under military rule. The Chilean Bishops' Conference said there should be room for clemency. The families of those abused under General Augusto Pinochet's rule reacted angrily, accusing the Church of turning its back on the victims. Some 3,000 people died during the military rule between 1973 and 1990. Chilean victims' groups have reacted angrily to the bishops' proposal. 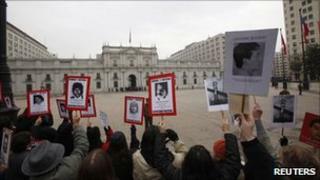 Hundreds of relatives of those disappeared or killed under military rule protested outside the government palace. Lorena Pizarro of the Relatives of Missing Detainees Association said that the Church should "see both sides of the coin" when it spoke of mercy. "There are many older ladies here who are still waiting to know what happened to their loved ones," she added. President Pinera has 10 days to answer the request.